In recent years, more data have come out on how well students are able to manage repaying their loans beyond the three-year window currently used for federal accountability purposes (via cohort default rates). A great 2015 paper by Adam Looney and Constantine Yannelis used tax records merged with data from the National Student Loan Data System (NSLDS) to show longer-term trends in default in repayment. Two days later, the release of the College Scorecard provided college-level data on student loan repayment rates going out seven years (even though the repayment rates were initially calculated incorrectly). Thanks to a lot of hard work by the data folks at the U.S. Department of Education and their contractor RTI, there are new data available on long-term student loan default rates. ED and RTI used NSLDS data going through 2015 to match records from the Beginning Postsecondary Students studies of cohorts beginning college in 1995-96 and 2003-04. This allowed a 20-year look at student loan default and payoff rates for the 1995-96 cohort and a 12-year look at the 2003-04 cohort, as detailed in this useful report from the National Center for Education Statistics. Thanks to NCES’s wonderful PowerStats tool, I took a look at the percentage of students in the 2003-04 entering cohort (my college cohort) who had defaulted on at least one of their federal student loans within 12 years. Many of the news headlines focused on the high default rates of students at for-profit colleges (about 52%! ), but this isn’t entirely a fair comparison because for-profit colleges tend to serve more economically-disadvantaged students. So in this post, I focused on racial/ethnic differences in default rates by type of college attended to give a flavor of what the data can do. 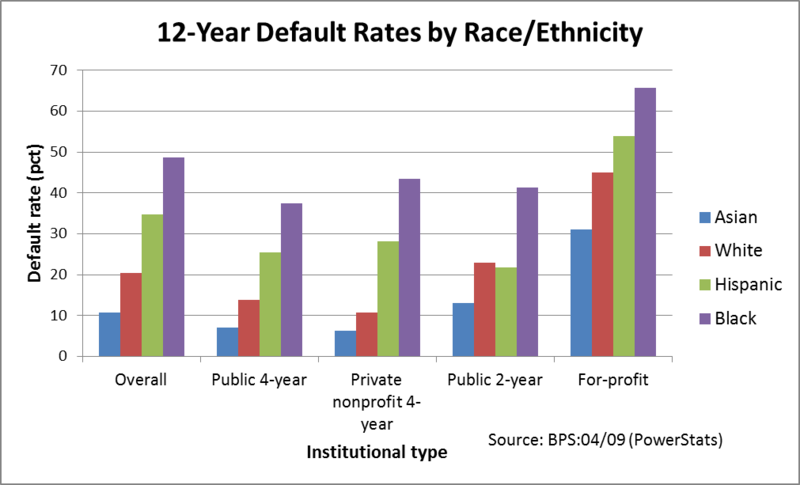 As the below chart shows, nearly half of all black students (49%) defaulted on at least one loan within 12 years—more than twice the rate of white students (20%) and more than four times the rate of Asian students (11%). The differentials are still present across sector, with more than one-third of black students defaulting across all sectors while a relatively small percentage of Asian students defaulted across all nonprofit sectors. Default rates at for-profit colleges are high for all racial/ethnic groups, with almost half of white students defaulting alongside nearly two-thirds of black students. An advantage of the PowerStats tool is that it allows users to run regressions via NCES’s remote server. This allows interested people to analyze the relationship between long-term default rates and attending a for-profit college after controlling for other characteristics. However, PowerStats is overwhelmed by requests by my fellow higher education data nerds at this point, so I gave up on trying to run the regression after several hours of waiting. But if someone wants to run some regressions using the new loan repayment data in the BPS once the server calms down, I’m happy to feature their work on my blog!